As a child, I just loved how Dr. Seuss played with words to delight anyone with the least bit of sense. I also loved the quirky characters - how they were drawn and described. 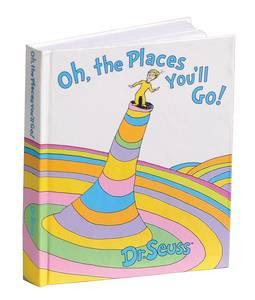 Decades later, I go back to Dr. Seuss, not just for the quirkiness, not for the play on words. Surprisingly, I go back again and again for some semblance of ... sanity? I do not know if that is the right word, but one passage that I can't get enough of these days is this excerpt from "Oh The Places You Will Go". On and on you will hike and I know you’ll hike far and face up to your problems whatever they are. You’ll get mixed up, of course, as you already know. You’ll get mixed up with many strange birds as you go. So be sure when you step. Step with care and great tact and remember that Life’s a Great Balancing Act. I can go on and on and on about how I should have stepped with great care and great tact. How I should have been more mature. But there really is no point in beating one's self up when mistakes have been made. One can only really look forward, and then take extra great care to remember that Life's a Great Balancing Act. How I wish I had even the smallest measure of strength I see in other people.